Injuries and inexperience took a toll on the team, and difficulties persisted as the Suns finished with their worst record since their inaugural season in 1968-69, when they won 16 games as an expansion team. The Suns bought out the contract of veteran big man Tyson Chandler, traded Anderson for combo-guard Tyler Johnson and found themselves in a three-team trade debacle with the Memphis Grizzlies and Washington Wizards, which fell apart amid confusion over which player with the last name “Brooks” – MarShon or Dillon – was intended by the Grizzlies to be included in the trade. 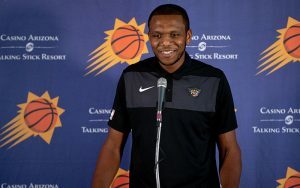 Many of the Suns’ future hopes are hinged upon the development of their young players, including Booker, Jackson, Ayton and Bridges. 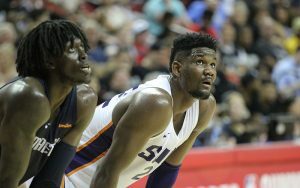 Ayton and Bridges in particular had strong rookie seasons, proving to be valuable building blocks for the future. Ayton averaged 16.3 points and 10.3 rebounds per game while shooting 58.5 percent from the floor. Bridges appeared in all 82 games for the Suns, the only player to do so, and showed precocious versatility on defense. With the likelihood of another high lottery pick in the June NBA Draft and still no solid answer at point guard, they continue to search for an identity.